Heathrow Airport is known for many things: the great number of passengers that use its services every year, a mixed palette of airline companies and ticket prices, five terminals (one is going to be reopened in June 2014), special services for more pretentious customers (luxurious lounges, boutiques, shower pads, etc.). 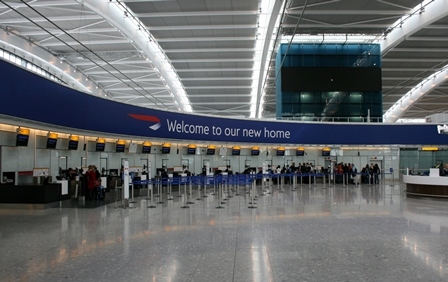 But probably the most important fact is that this airport provides many London Heathrow Transfer options. You will find below a short description for each of them. First of all, you can choose the services of a private hire company. This Heathrow Transfer has a number of benefits. It is very comfortable, especially if you are traveling with your entire family and require a child seat or maybe you have your best friends with you and you require some extra space for your luggage. Another benefit is that the driver will wait for you at a certain meeting point inside the terminal, a very important thing for travellers that are not used with Heathrow’s area. Moreover, it is very relaxing to know that somebody will track your flight and wait for you at any hour of the day or night. There are a great number of private hire companies that provide London Heathrow Transfers, so choose the one that meets your expectations. Another Heathrow Transfer option would be to take the London Underground. Each of the five terminals provides tube stations that can reach Central London via Piccadilly Line. They usually come every 5 to 10 minutes, so you do not have to worry about waiting too much. However, they only function until 23.55 pm on weekends. You can only pay in Sterling pounds, mostly coins, so make sure to have some on you, as ticket machine rarely accept payment by credit card. A second London Heathrow Transfer option by rail is by taking the train. The fastest one is The Heathrow Express, operating on a non-stop basis, seven days a week. Each terminal has its own schedule, so make sure to double-check it. Do not forget that the tickets must be purchased before embarking on the train. The price for a single ticket ranges between 20 and 30 pounds. If you have to travel between terminals, The Heathrow Express provides you with a free journey. Regarding London Heathrow Transfers by taxi, there is also the possibility to take the famous Black Cab, a renown British symbol. A great benefit is that you do not have to necessarily book in advance, but simply take one from the taxi ranks. However, for your safety, a 48-hour reservation in advance would be a great advice, as the service will thus include the meet and greet, name board and flight tracking. There are two big disadvantages: a Black Cab can only hold up to 5 passengers, so it is not the right choice for London Heathrow Transfers for larger groups, and the prices are rather high in comparison to all the other Heathrow Transfer mentioned above. If you want to feel more comfortable and safe or if you consider that renting a car would be better for you, you can use the M4 motorway to reach Central London. You can also get professional transfers from Heathrow to Gatwick using our Gatwick Heathrow taxi service..